I have WDMyCoudMirror with backup directory that have read/write permission only for specific user. I am not familiar with specifics of WDMyCloudMirror, but from what I understand Windows networking supports using different user credentials only at the share level, but not at the folder level. That is, \\server\share\foo and \\server\share\bar cannot be accessed using two different user accounts in parallel. The bvckup2 service runs under Local System account. Depending on the exact setup of your system and Windows flavor this account may not be able to access the network to begin with. One of the options you may want to consider is to set up a separate account for the bvckup2 service, grant it proper share access rights and then switch the service to run under this account instead of the Local System one. I seem to be experiencing the same issue as AlexS when running it as a service. I assume that the Local System account have network access (Win8.1 Pro) since Bvckup 2 is able to access the share and compare the source with the destination (with "Re-scan destination" as the way it detects changes). 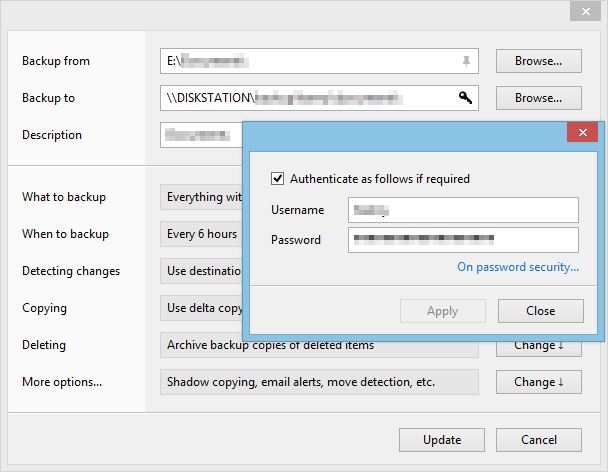 I have also configured Bvckup 2 to authenticate with a particular account (https://i.imgur.com/Sxhb0Fe.png) that has all the required permissions to read and write changes to the folder. However when I'm running the backup it fails when it tries to create folders or files with an access denied error. Could this still be related to the Local System account not having the correct permissions? The problem is that the share is on my NAS where I can't exactly map the shares to a Windows account. Kenny, yours is not the same issue. It looks like you also have a guest/anonymous *read-only* access enabled for the share, so that's what the app gets as it first tries to access remote locations without any authentication. This is ultimately the Windows Explorer logic, that's where it comes from. There are two ways around this. First is to force the app to log in (use authenticated access). Second is to add another share on the NAS end that has anon access disabled. Former is controlled by "conf.dst_net_login" setting in the backup's settings.ini. Changing it from 1 to 2 will force the app always access a share with supplied credentials. To make the change you will need to locate the .ini first (it'll be in the same folder where you got the .log from), then shut down the service, make a change and start the service again. Now, the fine print is that I don't know if this would help in your case, because it's not one of the tested setups. My suggestion is an educated guess. Many thanks! I was a bit suprised when I at first configured the authentication that the option didn't reside in the GUI to always force it to use the supplied authentication. However I'm once again impressed with Bvckup 2 that it was simply fixed by changing the settings.ini files for the backup jobs I'm running. It shows that while it wasn't yet implemented in the GUI, in the code itself it was fully supported. Even exporting/importing the configuration file after a fresh install of the computer worked flawlessly. This on a computer that hadn't even yet tried to access or authenticated the network device or share yet. I really can't articulate how awesome the software is and how it continues to make me re-evaluate other Windows software which doesn't match the same level of quality. Looks pretty well-articulated to me :) It's such a nice compliment, thank you very much. I'm genuinely happy to hear what you said! PS. Did changing that setting work though? Oh yeah, I changed conf.dst_net_login to 2 on all backup jobs and haven't had a single problem with the service mode since then.